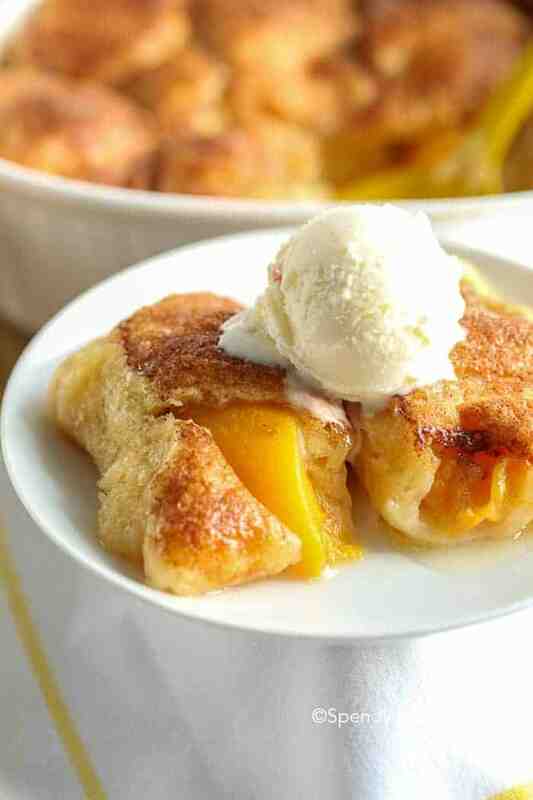 4 Ingredient Peach Dumplings may sound intimidating, with this recipe it is anything but! This yummy dessert comes together in a flash and requires only the simplest of ingredients, which you likely already have on hand in your pantry! Sweet juicy peaches wrapped in a flaky dough and baked until browned. Perfect served with a scoop of ice cream! 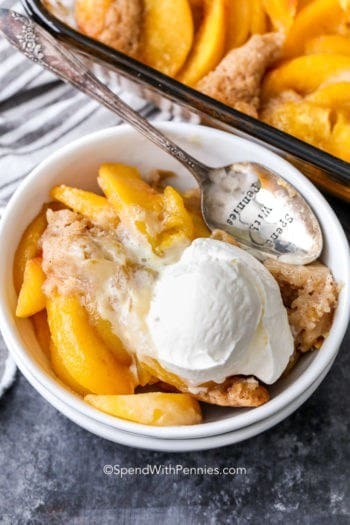 There is nothing quite like warm peach dumplings baking in the oven, filling your kitchen with an incredible aroma and then serving them warm with a big scoop of vanilla ice cream! They are comforting, delicious and absolutely crave-worthy! This recipe is likely to become one of your go-to recipes for an easy dessert at home with the family, or your next potluck or BBQ! 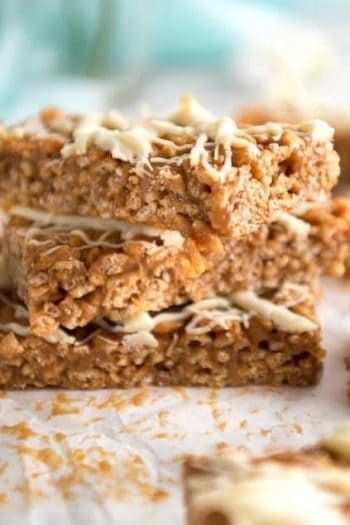 While these might taste like you spent an entire day in your kitchen baking, this recipe will leave you with plenty of time to enjoy some time with your family! Instead of making the dough from scratch, this recipe uses crescent rolls for a short cut making this incredibly quick! The use of canned peaches not only helps create the delicious sauce for this recipe, but it also makes this an easy year round treat! 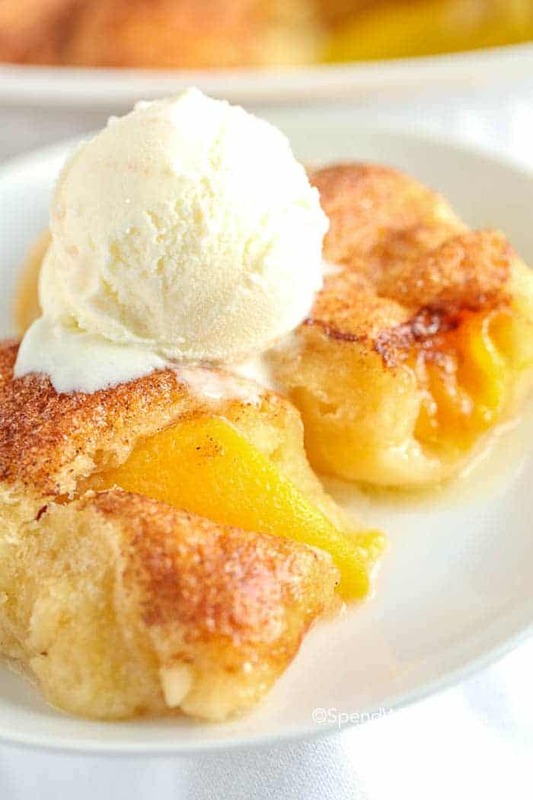 Sweet juicy peaches wrapped in a flaky dough and baked until browned. Perfect served with a scoop of ice cream! 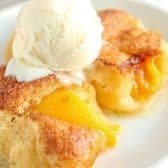 My family always requests this Peach Dumplings recipe when the weather starts to get warmer in the spring because this dessert tastes exactly like we imagine a sun-ripened summer day would if it had a flavor! The simplicity of this recipe ensures that I never deny their requests! The peach with the crescent rolls are tasty, however because of the liquid the bottom of the roll doesn’t cook and comes out wet, mushy and doughy. Any suggestion? Cindy, you’re right, the rolls should not be doughy underneath. You can cover with foil and cook for a few extra moments if the bottoms seem a little too doughy. Hope that helps! Yes, if the peaches are ripe, they should cook just fine! You can use Mountain Dew soda when using fresh peaches. Works great as well as great flavor. In follow up to one of the comments there are organic crescent rolls…Annie’s makes them at the store I buy from. Also I made this recipe with peaches in 100% juice…I didn’t see ‘light syrup’ only heavy syrup and juice so went the juice route and was a little worried but they turned out great! I did need to bake mine for 40 minutes and just sprinkled them with a spoon of sugar and a few dashes of cinnamon and it turned out great! Looks a little sad with just 8 going into the 8×8 casserole dish but they puff up quite a bit and it ends up covering just about the whole dish. 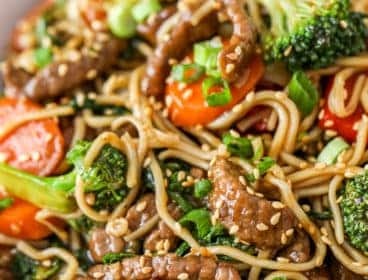 Easy, yummy, and kid friendly. Thanks for the recipe! Glad you loved it Charlene! I am new to baking. 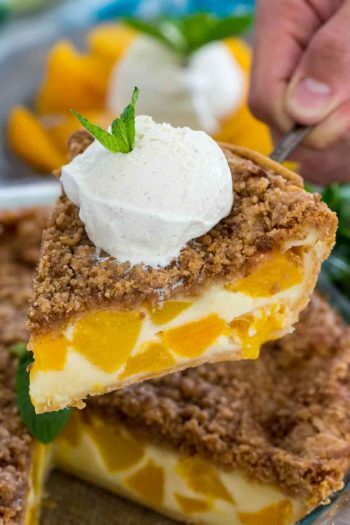 Can I use fresh tree picked peaches for this recipe? Hi Vonetta! Yes. If you use fresh peaches, you’ll need to replace the peach juice from the can with juice or with a soda like 7-Up. Just shocked to see my name here! Great recipe! And, yes, fresh peaches sound amazing!!! Hello, they are a canned biscuit that is very popular here! Puff pastry would be a good substitution that I believe you have in Australia! I have only made this recipe as written. You could try a sweet scone dough. I made this last night and while hubby was sceptical at first, he and I both agree it is very yummy! I accidentally bought the sliced peaches in fruit juice vs the halves in syrup but it in no way impacted the tasty factor. Very delish dessert and so easy! These recipes look so good! I will try them! Love your website! Thank you so much Mickie! 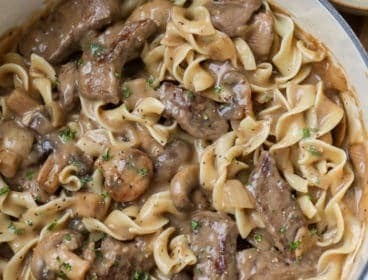 Can this be done in the Crockpot? Directions? I don’t think this recipe would work well in the slow cooker. 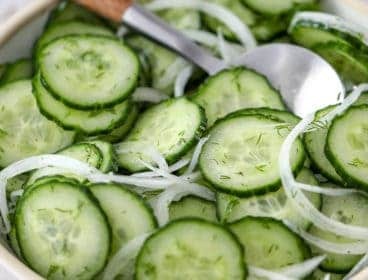 Any thoughts on how to convert this to a crock pot recipe? I don’t think this would work well as a slow cooker recipe. What if I only have canned peaches in fruit juice, not syrup. Should I add sugar? Thanks. 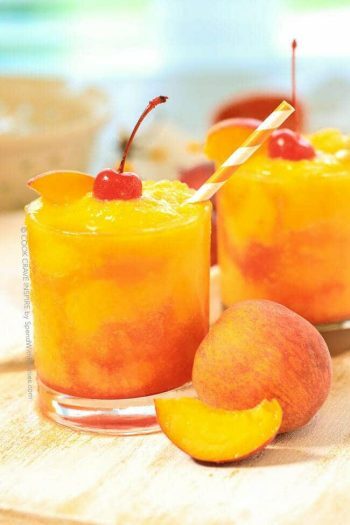 Peaches in fruit juice should work just fine in this recipe. What size can of peaches? Recipe doesn’t say. Thanks! You need a total of 4 peach halves. Looks good and so easy. Thanks! Yes, that would work. You will need to use another liquid (such as juice or Sprite) to substitute the peach syrup. Your recipes are easy and so delicious. If I were to use fresh peaches how many would I need? You will use 1/4 peach per roll so you would need two peaches for 8 rolls. Thank you so much for sharing your recipe n the reviews. Positive m negative I always enjoyed reading your blogs. Keep up the good work. Depending on your oven you may need to increase the cooking time slightly. All your food looks great. Hi holly ,was wondering can I use a can of sliced peaches ? 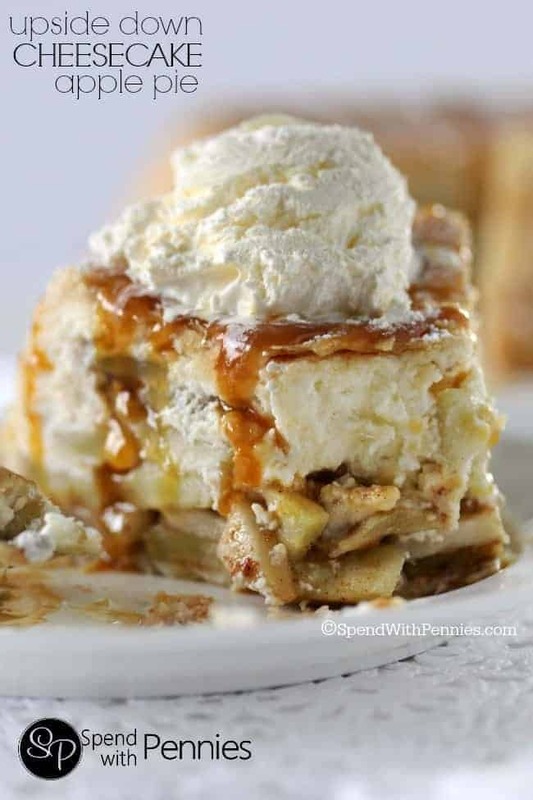 Holly – I have made “Apple dumplings ” for years , making my own caramel to pour over, (then Mtn. Dew). However, we are having a cooking class at church. Seven 8-10 year olds will be making dessert for about 50 people. We have only an hour so have to keep it simple! 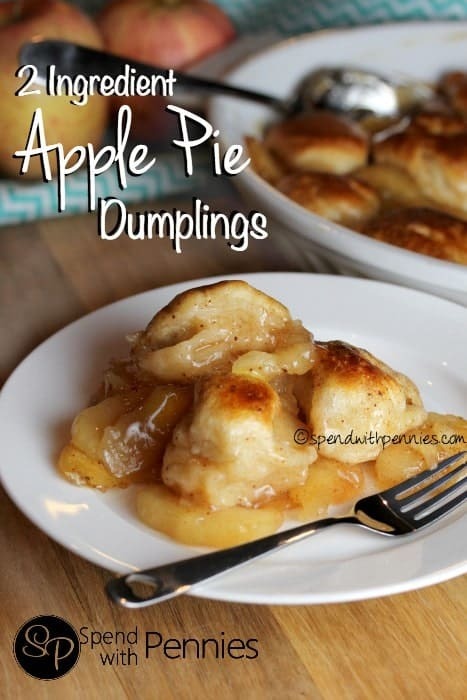 Your peach dumplings are perfect! How many crescent pkgs and cans of peaches? Thanks for your help. Each package of crescents contains 8 rolls. You will need about 7 rolls. The peaches will depend on the size of the can but you will need about 1/4 peach per roll so about 28 peach halves. Hope that helps. Loved it!!! Next time I will use the remaining peaches in the pan because I want more peach flavor. It sounds so delicious and I’m gonna try them send recipes to me. I love easy and simple recipes. Thank you. Peach dumplings sounds delicious. 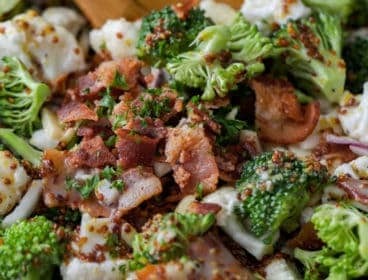 These recipes look simply delicious ! I can’t wait ti try them. Best of all they are quick and easy. So great for our busy lives. Yummy, great recipes easy and quick! I just made them, used fresh peaches, and was enough juice to add to butter. Had them with vanilla ice-cream. Very tasty and not a lot of sugar. So glad you enjoyed them Janice! Okay, my review. I tried this because I thought it would be any easy thing for my 83 year old dad to do for himself as he loves peach cobbler. I felt like the amount of butter and syrup were a little heavy so I cut the butter to 3/4 of a stick and cut syrup to 1/2 cup. I always put lemon juice in my cobbler so I added 2 tsp making it a 5 ingredient recipe, sorry. IT WAS AMAZINGLY FABULOUS! 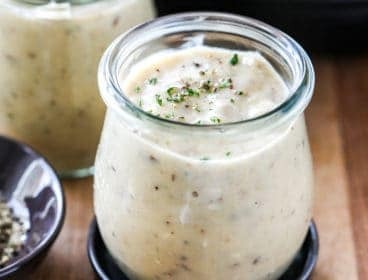 If you are making ahead, you might want to use more liquid because it soaks it up over time and might leave you without drizzling syrup for your ice cream. Also, I see no reason you couldn’t just lay out half the crescent dough, top with peaches and end with the second layer of dough. It would be even better (and easy) if you used fresh peaches when in season. But the beauty of it really is that you can pull it off just about any time! I’m going to make him one and take it to him with the ingredients to make another! 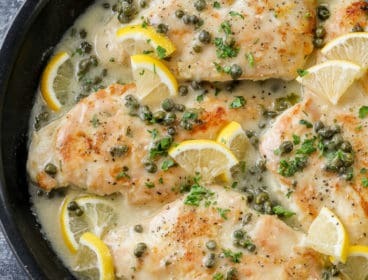 I’m so glad you loved this, I agree, lemon would be fabulous in this recipe! Here are a few of my favorite potato salad recipes. This uses store bought crescent dough. Crescent rolls are a refrigerated dough found in most North American supermarkets. I am trying this recipe this weekend. I purchased the Del Monte peach halves smaller can as indicated. However, I could not find the light syrup only the heavy syrup. Do you feel I need to dilute the syrup in any way to achieve the same result? Or do you feel the heavy syrup is OK as is? I think the heavy syrup should be fine as is. The video on facebook says to bake for 15 mins. Which is it? 15 or 30 – 35 mins. There is a typo in the video, it should have read 35 minutes. Sorry for any confusion. 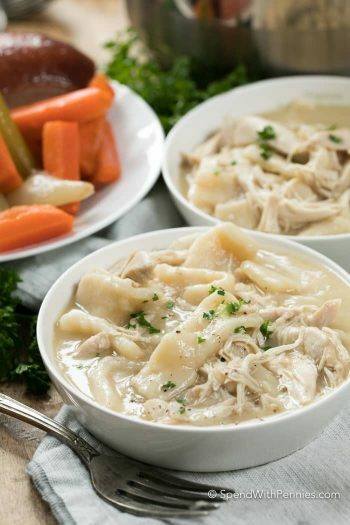 My friend Mary over at Barefeet In The Kitchen has an amazing recipe! Soft and Chewy Oatmeal Raisin Cookies. Could you make with fresh peaches also? Yes. If you use fresh peaches, you’ll need to replace the peach juice from the can with juice or with a soda like 7-Up. Can I use canned Apples instead of peaches ? That should work just fine. I would suggest replacing the peach juice portion of the recipe with apple juice. This looks so yummy… I’m making this. How do I use Fresh Peaches instead of canned? This would work with apple pie filling however you won’t have the liquid to create the sauce. You can sub in apple juice or another sweet drink (such as Sprite). Enjoy! 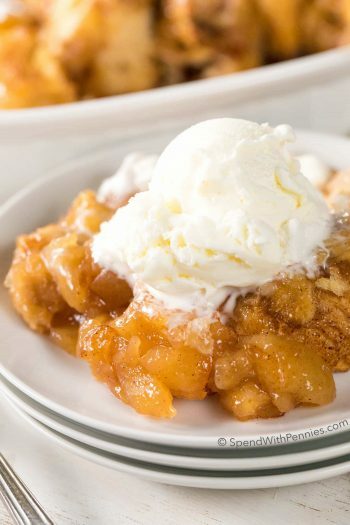 I made the peach cobbler so fast so easy and really really good.Thank you for the recipe. I will make others recipes of yours also. Do you have a cook book if so would Barnes and Noble have it ? I’m so glad you enjoyed it! I don’t have a cookbook as of yet. Get busy, your recipes are wonderful and I would buy your cookbook. LOL! Thank you so much Linda! Wonderful! Made this and it was delicious! Thank you for sharing this super easy recipe! Will the Grands Crescent work just as well? It’s bake time is only 12/15 mins noticed your’s say 30 to 35 mins. Will it take much longer due to size ? Yes, the bake time is a little bit longer because they are touching and in sauce. The grands should work just fine. You’ll want to make sure the center is cooked before removing it from the oven. Your peach recipe says to use canned peach halves, and the instructions say to cut peaches in half. Cut the halves in half, or just use the halves as they are? Sounds yummy. You’ll cut the peach halves in half again so each roll has 1/4 of a peach. 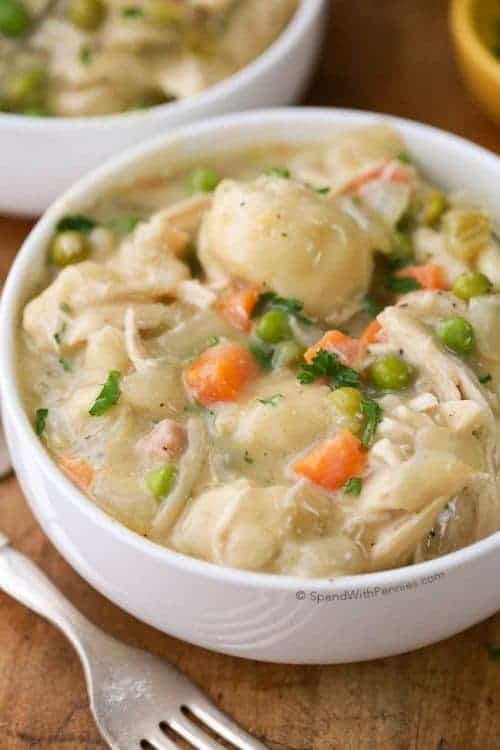 Looks very yummy Definitely going to make this. So what are the other two ingredients for peach dumplings???? 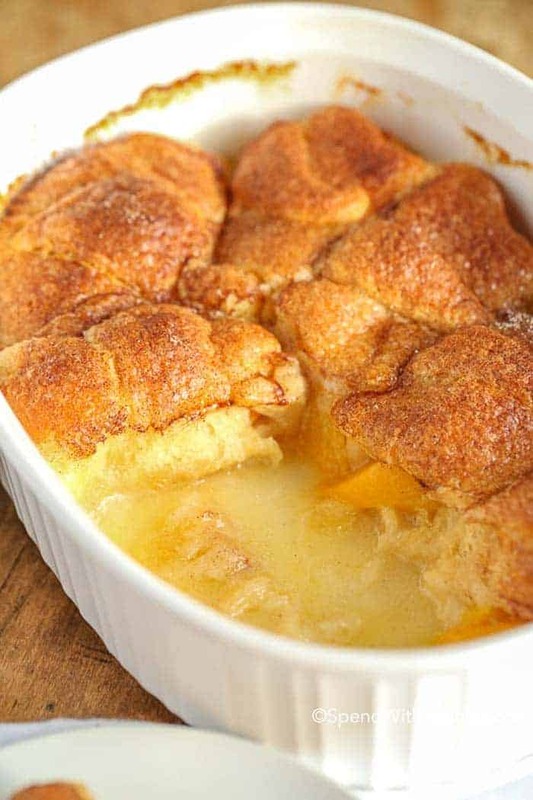 Peaches, butter, cinnamon sugar and crescent rolls. For the cinnamon and sugar mixture, how much cinnamon and how much sugar? Thanks. You can purchase it premade however, to make your own, you can mix 1/2 cup sugar with about 2 tablespoons cinnamon. Love this recipe idea. What if you just have peaches in heavy syrup? Or will that not work? So easy and delicious a go to recipe for any occasion. A must try for me easy and delicious. Keeper. What size can of peaches do you use? I use a smaller can, you will need 4 peach halves (each cut in half to total 8) and 2/3 cup of the liquid from the can. Do you have a favorite slow cooker cassarole that can be prepared directly from a grocery bag…in a hotel room? Sounds wierd, I know! But I am going to a picnic out-of-state and won’t have use of a kitchen. Just a mini fridge and outlet. Can you help? Yes, you could create a recipe similar to my lazy crock pot lasagna replacing the cheese ravioli with meat ravioli instead of making a meat sauce. That looks like a train wreck when served. But it still has the fabulous homemade lasagna taste. most bread machines have-a recipe to make crescent rolls. I think it is mix rise then roll out the rolls. What can you use in place of the syrup from the can of peaches? I am using fresh peaches. You can try a lemon lime soda (like 7-Up) or another similar sweetened drink. Please note that it will change the flavor but should still be delicious. 7-Up is no longer Lemon-Lime . It shocked me ! Thanks Bil, I had NO idea!! I’m totally surprised too! You can make a simple sugar too! Simple syrup is two things: sugar and water. The ratio is also simple: 2 to 1, sugar to water. They look so yummy. I just don’t like the crescent rolls, because of chemical additives. Have you ever seen organic crescent rolls? I haven’t seen Organic crescent rolls (although I haven’t looked for them). You could certainly try it with a defrosted bread dough. Almost every bread machine has a recipe for home made crescent dough. It may just be the mixing and rising part and you roll them out. Looks great – I will be making this soon. What size is the can of peaches?? I use the smaller can. You’ll need 4 peach halves (each cut in half to give you a total of 8). Holly, will the crescent rolls cook and not be dough-sticky beneath the juice? Hi Joann, thanks! The rolls should not be sticky dough underneath. You can cover with foil and cook for a few extra moments if the bottoms seem a little too doughy. I didn’t see an oven temp. for this. Sorry about that, I’ve updated the post. It bakes at 350 degrees. This looks amazing but at what temp do we cook this? I totally agree!! Eating fresh ripe juicy peaches (and corn on the cob) is one of my favorite parts of summer! I have peaches from The Peach Truck in my freezer.. Any suggestions as to how to substitute them for the canned peaches? If you thaw the peaches with sugar on them, the sugar draws out the peach juice. This, also, works on strawberries. Use enough sugar so that the juice will be as sweet as you would like. I use to freeze fresh, sliced peaches & this is what I would do so that we would have peach shortcake in the cold winter months. This is so genius, I’m not sure why I never thought of it!! Thank you Dorothy! They’re such an easy dessert!